User data is collected from you whenever you visit this site. To find out how Net4Society handles your data and the purpose of processing your data please refer to our statement on data protection. Net4Society is open to all National Contact Points for Societal Challenge 6 "Europe in a changing world: inclusive, innovative and reflective societies"- if you are a new Societal Challenge 6 (SC6) NCP, please contact us! We actively support networking in the research community and offer help in every respect of Horizon 2020 consultation. We foster visibility of Social Sciences and Humanities research and raise the awareness of societal impact. 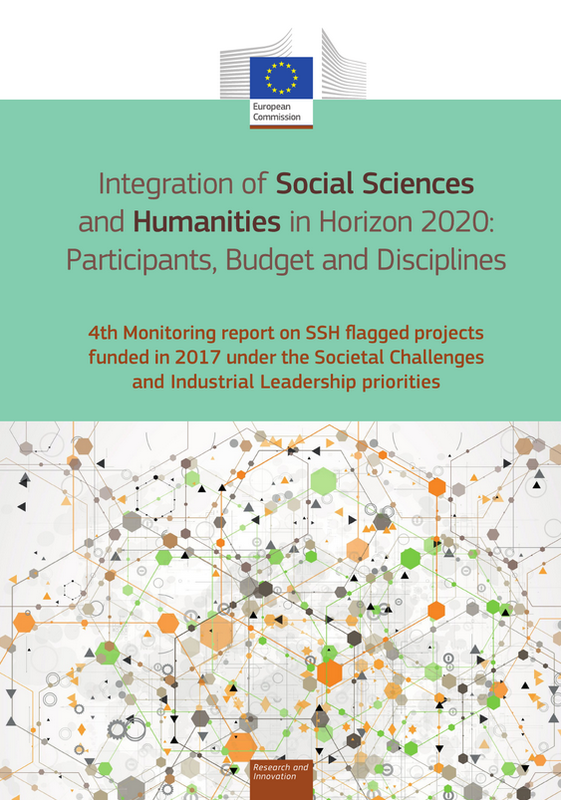 The European Commission recently published the fourth edition of the monitoring report on the integration of Social Sciences and Humanities (SSH) in Horizon 2020. 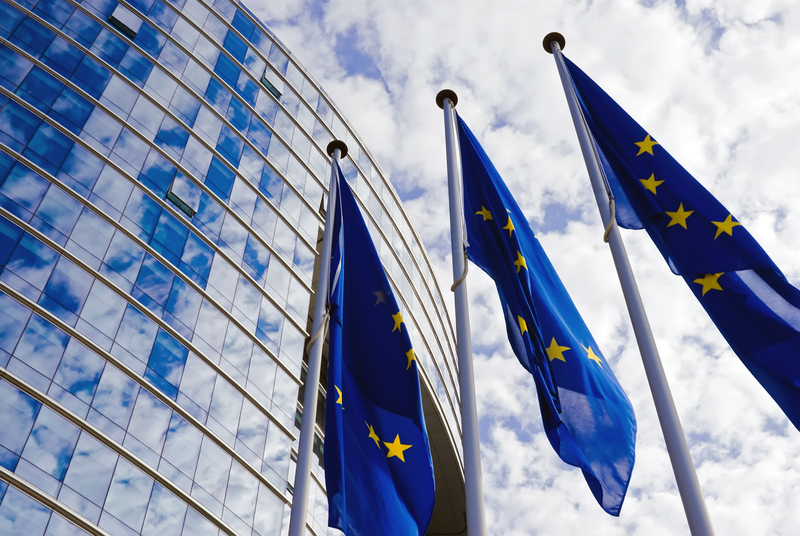 This report assesses how the different SSH disciplines have been integrated into the projects funded in 2017 under the Societal Challenges, the Industrial Leadership and the European Research Council. 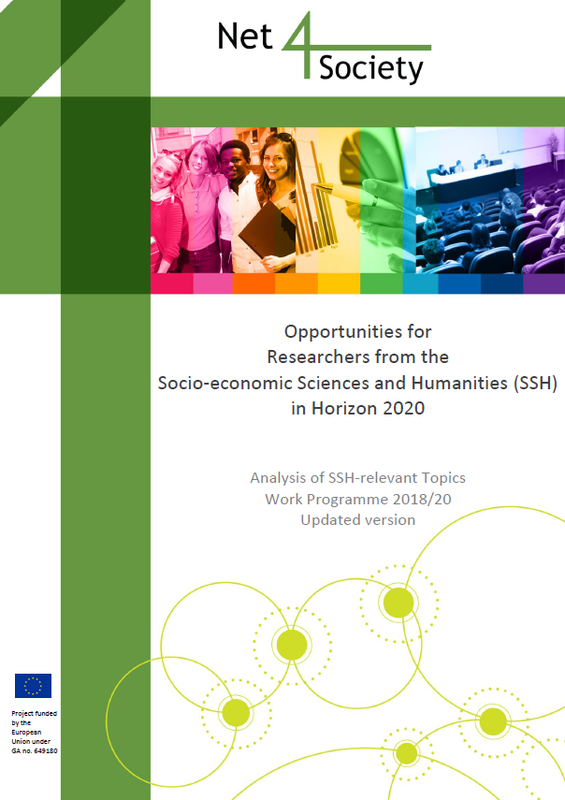 Net4Society has compiled the document "Opportunities for Researchers from the Social Sciences and Humanities (SSH)". It includes SSH relevant topics in all parts of Horizon 2020 within the context of the Work Programme 2018-2020. Net4Society developed a compilation of factsheets on SSH integration. 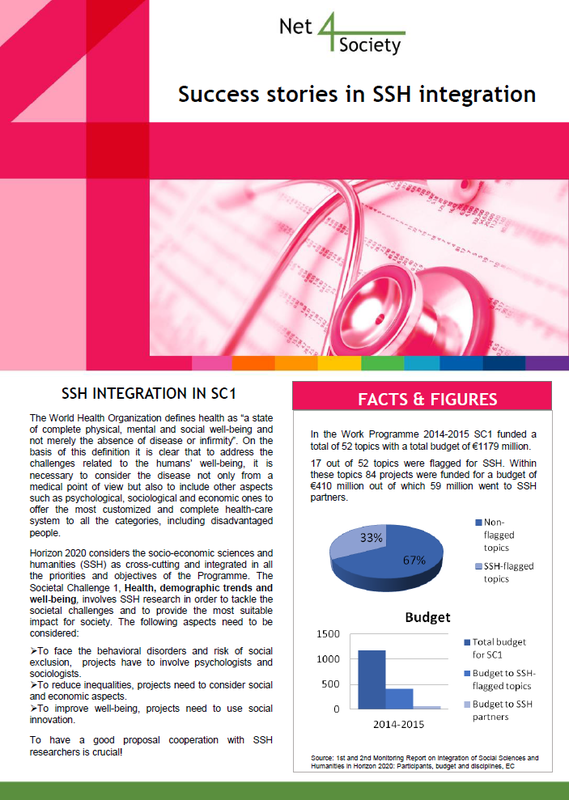 The series contains illustrations of all Societal Challenges throughout Horizon 2020 presenting best practice examples of successful SSH integration. ALLEA will celebrate its 25th anniversary in the opening of the 2019 General Assembly with a special address on the role of academies in European societies by ALLEA President Antonio Loprieno at the University of Bern on 8 May. On this occasion, Director-General for Research and Innovation Jean-Eric Paquet will deliver a keynote to commemorate 25 years of European academies’ cooperation and reflect on the future of European research. The celebration will count with the welcome address by the rector of the University of Bern Christian Leumann. The programme will continue with the ALLEA Madame de Staël Prize award ceremony and a festive reception. On 9 May, join us for a discussion in the scientific symposium “Science and Society in Present-day Europe”. You are also invited to the cultural programme, kindly organised by the Swiss Academies of Arts and Sciences and to be held in Bern and Basel on 9-10 May. The final event of ArchAIDE project will be hosted in Pisa, next 13-14 May 2019. The archaeological community is invited to attend the event and discover the results of the project. The ArchAIDE app will be shown and each participant will be able to download and test it. The key aim of ArchAIDE project is to help archaeologists in their daily work. ArchAIDE app aims to change the global practice of archaeology by allowing a user to quickly obtain information, by photographing a sherd, applying autorecognition technology to that photograph, and matching the sherd to items in the catalogue. The International Conference on Sustainable Development is organised by the European Center of Sustainable Development in collaboration with CIT University. This year the ICT Proposers' Day will be held on 19-20 September 2019 in Helsinki, Finland. ESSI Conference 2019: "Social Innovation and Socio-Digital Transformation"
“Social Innovation and Digital/Societal Transformation”, a key event on social innovation in the year 2019, is planned and designed by the “European School of Social Innovation” (ESSI) in cooperation with TU Dortmund University(Social Research Centre sfs) and the Federal Institute for Occupational Safety and Health. Representatives of scientific concepts, policy approaches and outstanding initiatives of social innovation will join. The conference will bring together the leading experts in social innovation research. NET4SOCIETY is a Horizon 2020 project funded by the EUROPEAN UNION. This publication reflects only the author‘s views - the Community is not liable for any use that may be made of the information contained therein.